Create the artwork as a digital file. We can design the artwork in consultation with you. Or you can prepare the artwork in JPG, TIF, PDF or PNG format. To print smooth pictures, the files must have high resolution, especially if the sign will be large. Print the artwork on adhesive-backed white vinyl. Large areas of color can be designed and printed. Laminate the artwork with a UV light-blocking polymer film. Cut the artwork out. The cutting pattern can be a regular polygon like a traditional sign, or can follow the outlines of the artwork, a process called contour cutting. Apply the cut out sign to the window. This step requires skill and some experience. Printed vinyl is the technology of choice for preparing logos and multicolor lettering. Cut vinyl is rugged and inexpensive, with classic appeal. Combine these technologies for glass door and window artwork. We offer professional installation of cut and printed vinyl in almost any weather, winter or summer. We also remove old vinyl if your information should change. 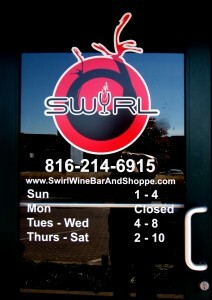 Contact Streamline Print & Design at 816-459-7552 to consult with us about your next door art design.